This may very well be the silliest, cutest dog trick ever. So cute! What a pretty dog, too. So cute! I wonder how you teach a dog to do that?! Dogs tend to do that occasionally for no particular reason. It sounds like it’s just a queston of catching them at it, and rewarding the behavior while giving it a name (ie: where’s your tongue). hahahaha. i started laughing when i read the post title. laughed even more when i watched the video. hahaha.. soooo cuuute!!! 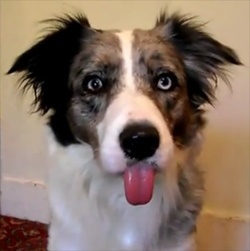 totally clever….what a great (and beautiful) dog!